At Florida’s southeastern tip, Miami is a vibrant city whose Latin American influence is reflected in the cafes and cigar shops that line Calle Ocho in Little Havana. Miami Beach, on barrier islands across the turquoise waters of Biscayne Bay, is home to glamorous South Beach, famed for its colorful art deco buildings, white sand, surfside hotels, and trendsetting nightclubs. The Miami metropolitan area is the most populous metropolis in the Southeastern United States and is the eighth most populous and fourth-largest urban area in the United States, with a population of around 5.5 million. Miami skyline from the bridge to Miami Beach. The popular image of Miami consists of sun-soaked beaches and swaying palms with a backdrop of tall condominium towers defining the skyline. Today, the city contains urban complexities and cultural amenities that defy the old stereotypes. There are more towers than ever, with the new developments reflecting the dynamism of a 21st Century city that seems to be growing into its relatively young skin. Although there are currently no supertall skyscrapers in Miami, the city is home to an impressive number of 150-plus-meter skyscrapers, including 20 that are under construction, amounting to 60 percent of the completed total. 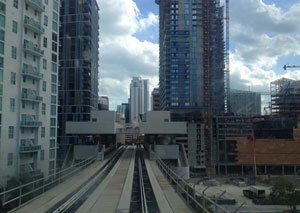 With a metromover station on site, the Brickell City Centre is a transit oriented development. The densifying Miami skyline is accompanied with an impressive list of cultural and infrastructural improvements that have taken place over the past few decades. These include the immensely popular Art Basel fine-arts show, the emergence of the bohemian Wynwood and Design District neighborhoods, the Perez Art Museum Miami, the New World Symphony, a vehicular tunnel under the Port of Miami, which will accommodate the largest container ships, and a privately developed high-speed rail project. The two-day Miami Region Tour sought to expose visitors to many of the developments currently under construction as well as the tallest competed towers in the city in order to explore how skyscrapers have impacted the city’s urban environment. A tightly-packed tour schedule allowed attendees to maximize their stay through a number of illuminating site visits. After an evening of traveling following the conclusion of the New York portion of the 2015 conference, delegates met for a continental breakfast at the Viceroy Hotel before starting the tour. The first day of touring was largely dominated by several visits to planned and under-construction skyscrapers. After breakfast, the first stop was the Brickell City Centre, a major skyscraper complex being developed near the confluence of the Miami River in the southern portion of the city’s central business district. 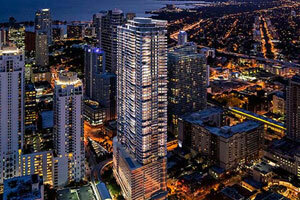 The group stopped by the sales office for the Brickell Flatiron Building, rendered above. The group had the opportunity to tour ongoing construction on the site, which features several residential/hotel towers and planned mixed-use buildings to be added in later phases. Attendees noted the high degree of transit availability built into the site. A metromover station is located at the heart of the development. The next stop of the morning was to the sales center for the Brickell Flatiron Building, located on the future site of the proposed high-rise, just a few short blocks from the Brickell City Centre. There, the group was given an overview of the residential tower, its design, and its structural engineering. They were also able to view a large model of the tower located within the office. Next, the group walked north to One River Point, located on the north bank of the Miami River. This is another project that is in the planning stage, so attendees were treated to a presentation on its design and inception. The tour group visited Ten Museum Park, a 178-meter residential high-rise. The last visit for the day brought the tour to the site of One Thousand Museum, a 215-meter tower designed by Zaha Hadid that began construction in the summer of 2015 and is scheduled to be completed by 2017. The group was shown a birds-eye view of the site from an adjacent high-rise. That night, attendees were treated to dinner at La Veinte Cantina, an upscale Mexican restaurant situated on the ground floor of the Viceroy Hotel with great views of Biscayne Bay and Miami. The events of day two followed closely to the activities of the first day. The morning began with a site visit to the under-construction Panorama Tower, located along Brickell Avenue in the vicinity of Brickell City Centre and the Brickell Flatiron Building. At the time of the visit, construction had already progressed up the podium of the 251-meter building. The group toured the site and made it to the highest completed floor for some panoramas of the surrounding area. 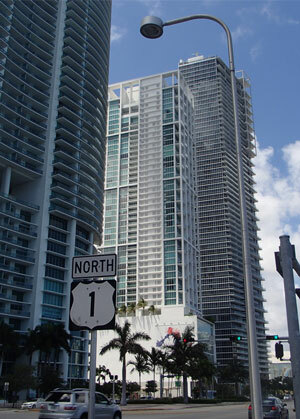 Located a few blocks south of the Panorma Tower, SLS Brickell was the next stop for the group. Another under-construction high-rise, this building was much farther along. The distinctive shape of the balconies could be clearly read as cladding had begun for much of the tower. As the group climbed higher on the site, they were treated to spectacular views of Biscayne Bay and Miami Beach. After lunch, the final visit of the tour was to Ten Museum Park, a 178-meter residential high-rise that was completed in 2007, during the city’s previous building boom. The group toured a model apartment as well as rooftop amenities spaces, giving them yet another opportunity for spectacular views. As the culminating event of the tour, it was also deemed a worthy spot to take a group photo.